It’s been already 20-plus years since Goatwhore came here to spoil our brains with some nasty Louisianan blackened swamp death. These guys are a metal institution on their own. With their sick creations of pure evil they have been corrupting souls in a way many other obscure bands could learn from. Let’s take a look at their latest piece of sickening gore art: “Constricting Rage of the Merciless”. Well, you’ve got bands with skills that deliver us high end technical riffs and there are bands that bring us real raw emotions and leave a black spot on your soul while blasting it loud. Well, consider Goatwhore to be among the second category. Not saying the blokes ain’t talented! Hell no, they mastered creating the perfect vibe that fits the sickness they want to pour out among us. Lyrical-wise we get treated again on the twisted demonical stuff we are used to getting spit out by master lyricist Ben Falgoust. The record is pure organic and raw. With most times a good blackish vibe poured over the sound that Goatwhore has established, they manage to us bring another piece of death cult. Some parts of this record bring us straight back to 80ties thrash, without losing the dirty atmosphere Goatwhore has sucked us into. Not everyone will digest the blasphemy and gore they spoil us with. On the other hand, if you can’t handle these outstanding songs, you might consider listening to another genre than death metal! Hail Goathwhore! Thanks for another black spot on my already restless soul! 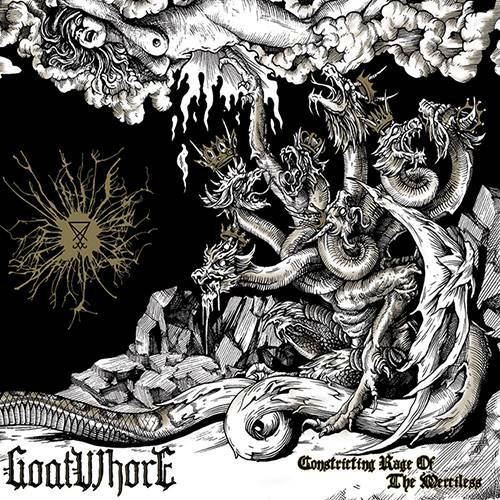 Goatwhore have outdone themselves again! Hail the masters of Swamp Death! Even een kleine pauze! plus een nieuw Crewlid.